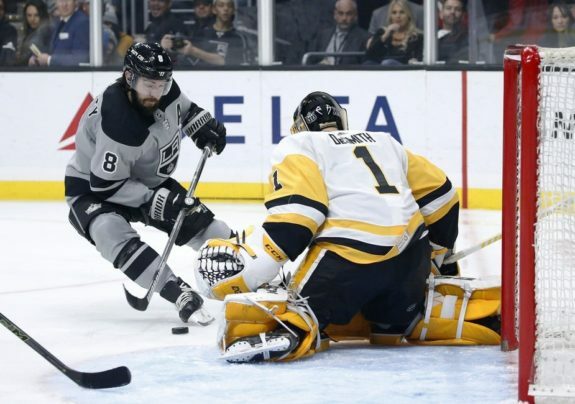 LOS ANGELES — Jonathan Quick stopped 38 shots to get his 301st win, leading the Los Angeles Kings to a 5-2 win over Pittsburgh on Saturday night, snapping the Penguins’ six-game road winning streak. The Kings took a 2-1 lead at 8:47 of the second period. Alex Iafallo was credited with his 10th goal after a centring pass by Carter struck him in the side and went in. Guentzel got his fifth goal in the back-to-back games against Anaheim and Los Angeles by scoring on the power play at 9:20. Kopitar added an empty-netter with 47 seconds remaining. The Penguins went in front 1-0 at 5:30 of the first when Guentzel backhanded in a rebound of Sidney Crosby’s shot to extend his point streak to six games. Carter tied it at 1 at 10:58 after stealing the puck from defenceman Marcus Pettersson and beating DeSmith with a slap shot. NOTES: Quick is 68 wins behind Tom Barrasso in third place. Ducks goalie Ryan Miller is tied with John Vanbiesbrouck for most wins by a U.S.-born goalie at 374. … Guentzel has seven goals and three assists during a six-game point streak. … Evgeni Malkin got his eighth assist during a six-game streak.